As American men flooded into the military during World War II, women took over many of the jobs on the home front, most famously wartime manufacturing. And—apparently—coffee tasting. Coffee-testing is an “art” requiring long experience and training - and until recently exclusively a man’s job. The war has brought women into this field, as into so many others. Elizabeth Zullo, left, and Lois Woodward, two of the girl testers, with F.C. 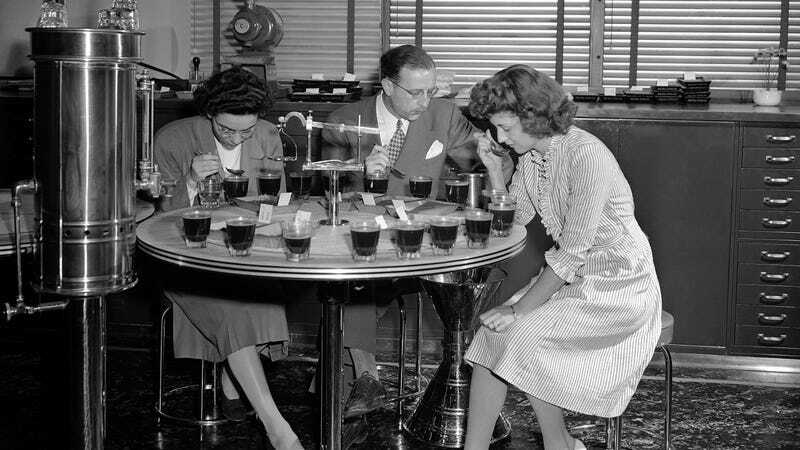 Byers, taste and smell various brews of coffee to determine quality, at the Hill Brothers coffee roasting plant in Edgewater, N.J., June 15, 1944. Women: Perfectly capable of testing coffee every bit as well as a man, despite our delicate constitutions.